Actively-managed mutual funds have a lot of flexibility over the types of investments they hold. One problem with this flexibility is that it often leads to style drift, which is a term used to describe a gradual change in investment style within a fund. Style drift is important to understand since a change in the investment style of a single fund could change the expected risk and return of your overall portfolio. Avoiding style drift is one of the many reasons investors select index funds over actively-managed funds. Since index funds track specific indexes, their holdings and investment strategies are completely transparent. Managers of index funds aren’t able to change the investment style since they are required to replicate the performance of the index they follow. For example, an index fund that tracks the S&P 500 Growth Index isn’t going to start investing in emerging market stocks because the manager thinks they look cheap relative to US stocks. Likewise, a mutual fund that tracks the MSCI World ex-USA All Cap Index isn’t going to hold US stocks. With a portfolio of index funds, you’re in control of how much exposure you have in a specific asset class. And not having to worry about style drift in your portfolio helps you keep the hot side hot, and the cool side cool. Okay. So now that I’ve told you that you don’t have to worry about style drift in your index funds, I’m now going to explain why you have to worry about style drift in your index funds. Confused? Let me explain. Let’s consider US small-cap stock indexes to illustrate how an index fund might drift off course. There are several indexes that track US small-cap stocks, and each individual index has a specific set of criteria to determine what constitutes a “small-cap stock.” The stocks of companies that meet the criteria will be added to the index, and the mutual funds that track that index will be required to buy that company’s stock. In the same manner, index funds have to sell stocks that are removed from an index. Instead of having strict breakpoints to define “small-cap”, many indexes have bands that allow the index to continue to hold a stock after it migrates out of the small-cap portion of the market. This happens when a small company continues to grow and enters the “mid-cap” area of the market. The basic idea behind bands in an index is to reduce turnover and trading costs for the mutual funds that track that index. Certain indexes from the Center for Research in Security Prices (CRSP) use bands instead of breakpoints. (You can read more about banding and migration at the CRSP website here.) In 2013 Vanguard changed the indexes that many of their funds follow to CRSP indexes, so Vanguard funds that track CRSP indexes will use the bands when rebalancing. 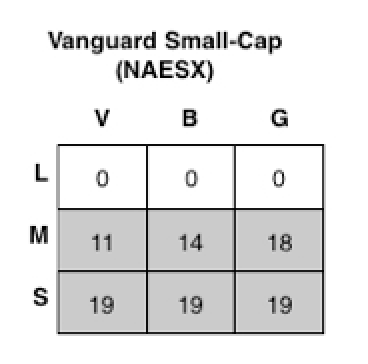 The table to the left shows the percentage of stocks in the Vanguard Small-Cap Index fund that were considered large-cap (L), mid-cap (M), and small-cap (S) as of 12/31/2016. At that time, only 57% of the fund’s holdings were classified as small-cap stocks. The remaining 43% of the fund holdings were mid-cap stocks. Dimensional Fund Advisors (DFA) is another provider of index funds. DFA fund track proprietary indexes and aren’t required to stick to strict trading bands or breakpoints like traditional index funds that replicate indexes maintained by companies like S&P, MSCI, and CRSP. The table to the right shows the holdings of the DFA US Small-Cap mutual fund as of 12/31/2016. At the end of 2016 the DFA US Small-Cap fund held 93% of its assets in small-cap stocks, much more than the Vanguard fund that tracks the same segment of the market. The average market cap (i.e. company size) of the two funds helps illustrates how different they are. Vanguard Small-Cap had a weighted average market cap of $3.284 billion on 12/31/2016. 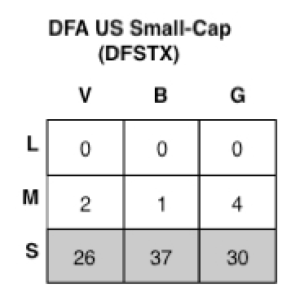 The weighted average market cap for DFA US Small-Cap at the end of 2016 was $2.215 billion, or around 33% smaller than the Vanguard Small-Cap fund. So when it comes to US small-cap stock funds, my opinion is that DFA US Small-Cap is a much better option than Vanguard Small-Cap. Both are index funds, but the DFA fund keeps a much stronger exposure to small-cap stocks and their potential to outperform larger stocks over time.